Two Fat Men Catering started out as a way to cater an annual cancer benefit meal. As the benefit grew in size and scope so did the catering business. Two Fat Men's specialty is Southern cuisine kicked up a notch with a gourmet twist & up-scale barbeque. The love of food and creativity in the kitchen has also inspired Two Fat Men Catering to create menus based on Italian, Asian, SouthWestern, and even Vegetarian cuisine! With much skill and experience Two Fat Men Catering can accomodate almost any special diet or request. 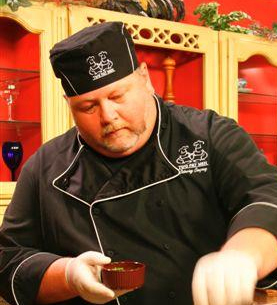 Now, working with only the finest ingredients, local sourced whenever possible, we strive to create creative, unique, and delicious menus you’ll be talking about at Mo'Cara restaurant in Lebanon, TN! One goal of opening our restaurant is to create a dining "experience" - creative, unique, and fun twists on old favorites, plus a number of unique dishes you may have never tried before! If you're looking for plain and ordinary you're in the wrong place! If you're looking for something new, something exciting, and a restaurant where great food and quality service are key, join us for dinner at Mo'Cara!